HORHAM, PA, USA – Newage Testing Instruments, an established leader in hardness testing equipment, has launched a new website: www.hardnesstesters.com. 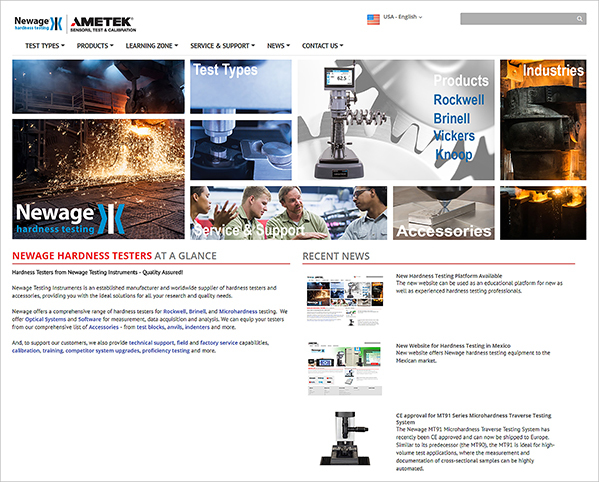 The new website invites visitors to experience the full range of hardness testing equipment offered by Newage covering Rockwell, Brinell, Vickers and Knoop testers along with accessories and software for hardness and microhardness testing. Among the new features on www.hardnesstesters.com is a LearningZone, which provides hardness testing professionals with helpful tools such as guides to hardness testing and how to select the right hardness tester, conversion guides, videos, articles, ASTM standards reference guides and a glossary explaining the most commonly used phrases within hardness and microhardness testing. This way the website can be used as an educational platform for experienced as well as new hardness testing professionals. The backbone of the website is easy navigation, which allows users to find what they are looking for in virtually no time. Users can navigate by industry, test type or they can go to the Products menu to find a specific type of product. Furthermore, the website’s Service & Support section offers quick access to product manuals and an FAQ section offers visitors answers to some of the most frequently asked questions about the Newage products. Newage testing Instruments is a part of AMETEK STC, a world leader in materials testing equipment, and the company has manufactured supplied hardness and microhardness equipment globally for more than 60 years. Among some of the strong brands supplied by Newage Testing Instruments are Versitron, Indentron, B.O.S.S. and HiLight. For more information please visit www.hardnesstesters.com.